This post has sat in my drafts folder for many weeks now, waiting for the right motivation to hit. In fact, it has languished since the NPR article on lentils came out nearly two months ago. But now, with the Live Below the Line Challenge less than a week away, lentils are very much on my mind. Why does the prospect of subsisting on $1.50 per day conjure up visions of little legumes? Well, lentils happen to provide a whole lot of calories, protein, and fiber for very little cost. Lentils are particularly attractive for the poor and hungry - they are high in protein; don't require much, if any, added fertilizer (they fix their own nitrogen); store easily when dried; and can grow in poor soils and harsh environments. A testament to this, the Consultative Group on International Agricultural Research (CGIAR) estimates that 70% of the lentils produced stay in developing countries. And people have relied on the little lentil for sustenance for over eight millennium! While there are many ways to cook a lentil, a common thread seems to pervade dishes throughout the world. In Praise of the Humble Lentil begins with an anecdote of a simple lentil-rice dish, Mudardara. Variations of this exist around Mediterranean regions, but also legume+grain dishes are the staple of most people around the globe. Think maize and beans in Latin America. 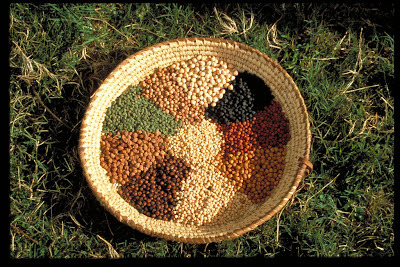 Or cowpeas and sorghum in Africa. Or, mung beans (or lentil dal, yum) and rice in South Asia. Regardless of where you are on the planet, however, this mix of protein and carbs is generally satisfying and nourishing. While not providing the slew of micronutrients that colorful vegetables bestow, it is a critical contributor to feeding a hungry population. Check back in on Monday to see what's on the menu for the week! And consider contributing to my efforts to raise funds for the Rainforest Foundation.